Lee Cullum is host of CEO, KERA’s original monthly series of interviews with North Texas business leaders that airs on KERA television and radio. She is also a commentator for Morning Edition on KERA-FM and contributes columns to The Dallas Morning News. A veteran journalist, Lee was previously a commentator for The NewsHour with Jim Lehrer and All Things Considered on NPR. In addition, she was editor of the editorial page of the Dallas Times Heraldand host of Conversations, a series on KERA with major newsmakers. Lee also worked as a reporter, on-air moderator and executive producer of Newsroom on KERA. Lee is a senior fellow of the John G. Tower Center for Political Studies at SMU and a fellow at the Dallas Institute for Humanities and Culture. 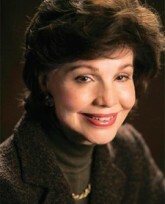 On the board of the Council on Foreign Relations for 10 years, she currently serves on the board of the American Council on Germany, the Pacific Council on International Policy, the Dallas Committee on Foreign Relations and the Social Sciences Foundation benefitting the Graduate School of International Studies at the University of Denver. She is a member of the National Committee on U.S.-China Relations and the InterAmerican Dialogue, and serves on the advisory board of the International Programs Center at the University of Oklahoma.